Please make this block in October to bring to the November meeting. 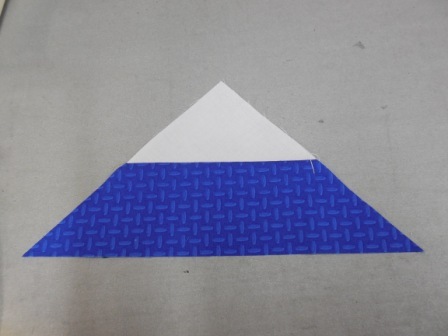 We will be using white fabric for the background and two other colors within the primary/secondary color range. These colors include red, blue, yellow, green, purple and orange. 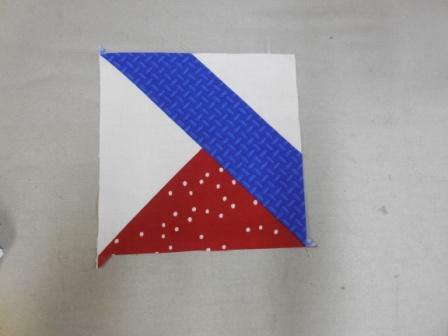 Please try to stay within the purest of these colors that you can to make the final quilt cohesive. 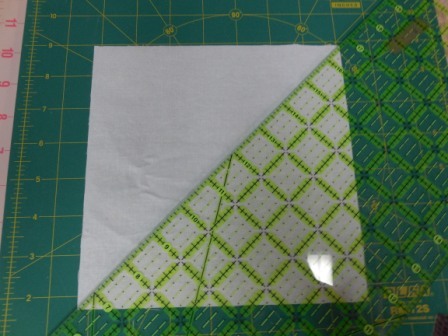 Cut the large white square diagonally both ways without moving the pieces between cuts. 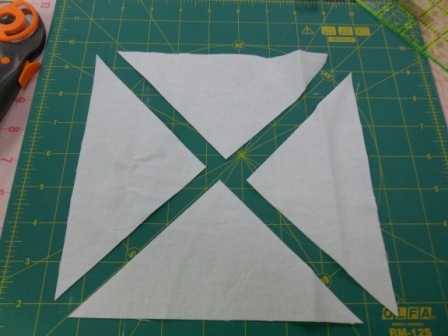 Cut the two smaller white squares in half diagonally. I hope you have enjoyed this trip to the Balkans–no passport needed! 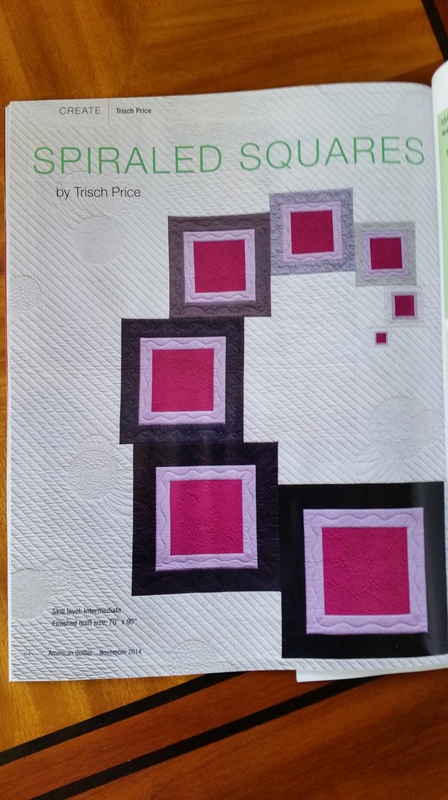 The November 14th issue of American Quilter has arrived in my mailbox!! I am especially excite because my sister Trisch Price is featured inside. 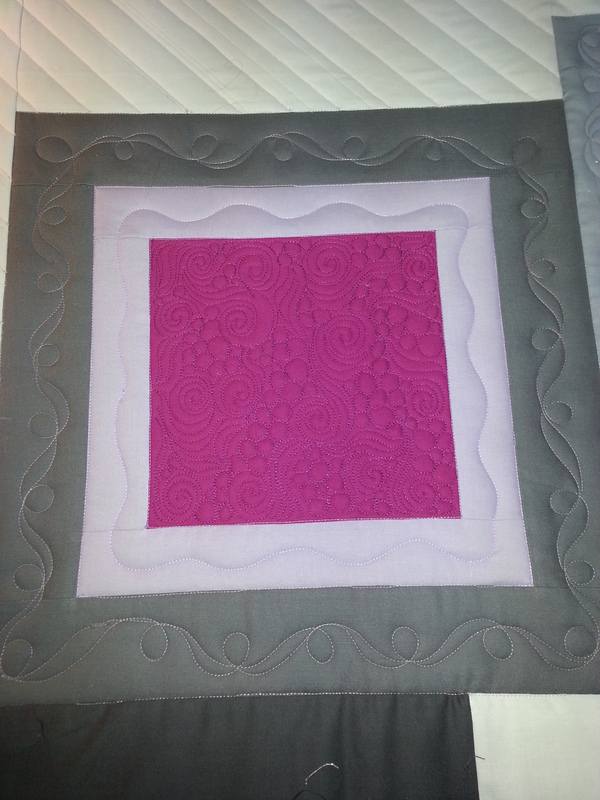 I was also privileged to quilt one of her newest quilts. She has also provided a pattern for this quilt. 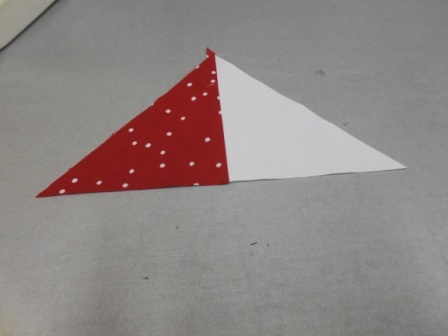 In her book she identifies 6 elements of negative space that modern quilters use in their quilts. She created all new quilts for this article so if you have purchased “Accentuate the Negative” you know they won’t be the same ones as in the book. When it arrived I knew immediately how I was going to quilt it! My inspiration came from my childhood. I remember one of my favorite coloring activities was to take a black crayon, close my eyes and sort of scribble on the paper. Then I would color in the segments that were created with all of my favorite colors. I knew I wanted to create segments to use different filler designs but also knew that I didn’t want to “scribble” all over the quilt. (Pretty sure that wasn’t what Trisch had in mind either). I pulled out all of my circle templates and started making what looks like Venn diagrams to create my segments. I placed those somewhat randomly in the negative space. 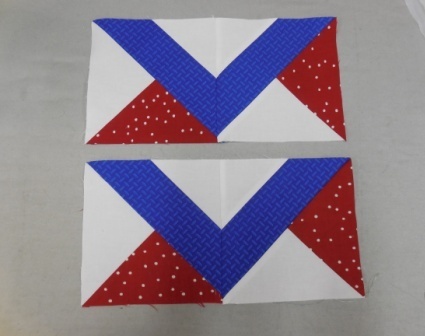 As I got closer to the squares I stopped to secure each of them by stitching in the ditch. 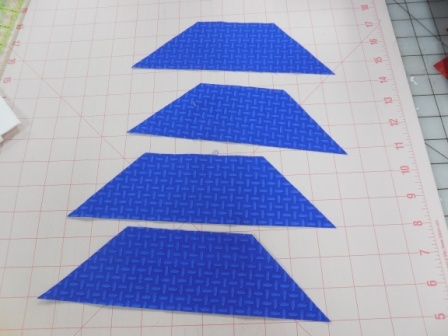 They were so perfectly lined up and I didn’t want my quilting to distort them. 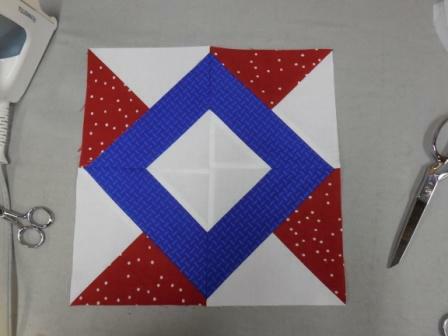 The diagonal lines were a lot more challenging than I anticipated and I doubt I will ever do them on another large quilt unless it is block based. The squares however were a fun respite from the lines. Using mostly swirls and pebbles I filled in the center blocks. I simply used wavy lines in the first border and a ribbon-like motif with loops around the outer border of each square. 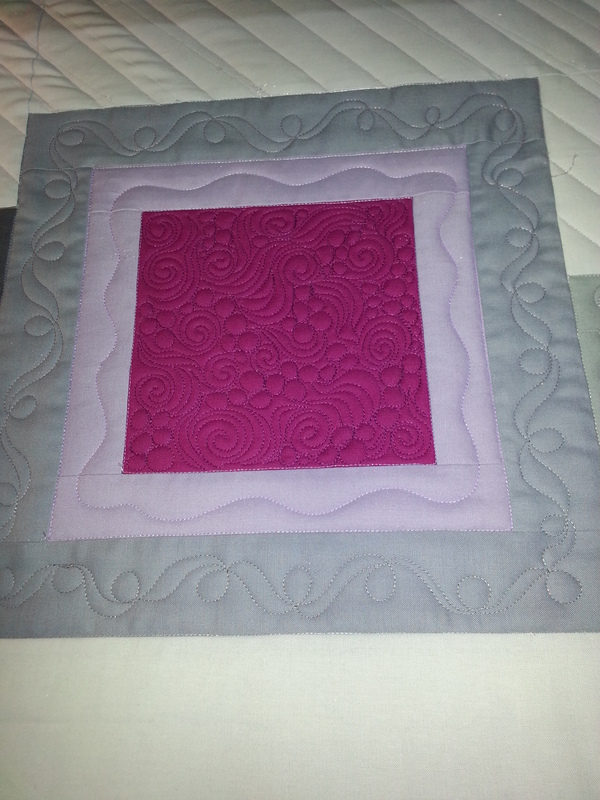 I truly enjoyed quilting this beautiful quilt. I am always inspired by my sister’s creativity. 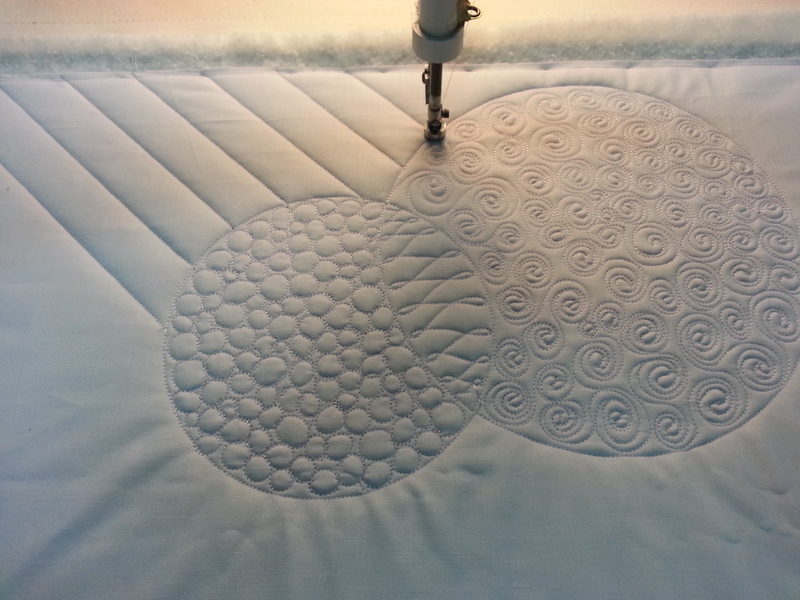 You can check out her blog at Hadley Street Quilts . 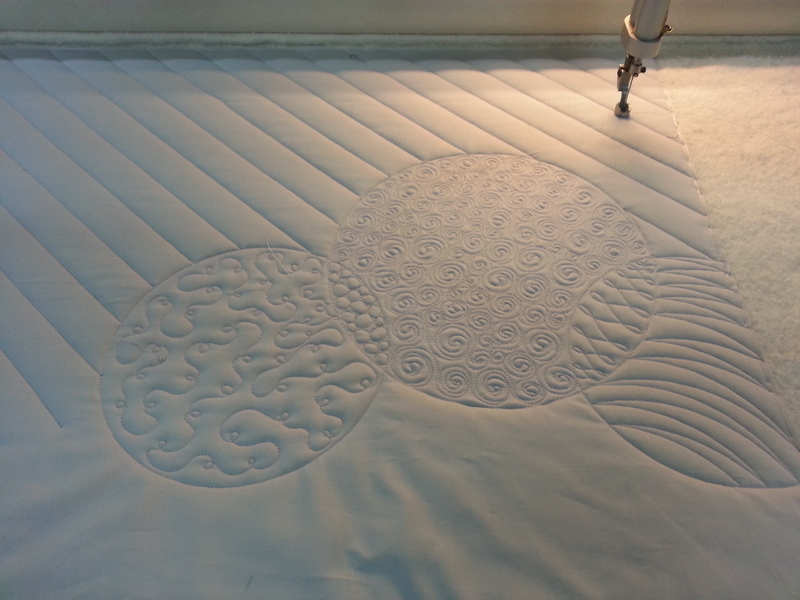 On her blog you will find some handy quilting tips as well as some of her beautiful quilts. If your local quilt shop doesn’t have her book “Accentuate the Negative” ask if they might order it for you. We love to support our local quilt shops!